On this day it seems that my ROW 80 Check-In is insignificant compared to what today marks. It was ten years ago today that our nation came under attack. Thousand of people lost their lives. Hundreds of people were heroes. At this moment, there is television coverage and reflections on MSNBC. I sit here, crying as I watch footage of people running for their lives as the Twin Towers come crashing down. The Pentagon mutilated. A band of heroes on Flight #93 who, in their bravery, prevented the deaths of many more Americans. 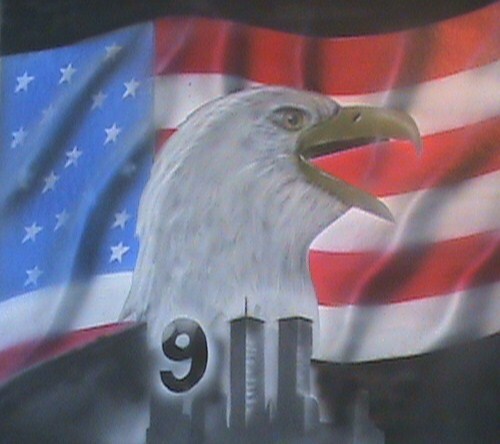 God Bless the fallen… we will never forget 9/11/01. Every person that was alive and over the age of twelve on 9/11/01 can most likely recall exactly where they were the moment they heard the horrific news that an airplane had crashed into one of the Twin Towers. I was sitting at the front desk of Olympic Paper Company in Philadelphia, PA. I was 28 years old, in college and blindly beginning a serious alcohol and drug problem. The weather that day was amazing. At first I thought, wow, how tragic. I guess the pilot fell asleep or something. I mean, to crash into a building in a densely populated city, there must have been a malfunction on a surreal level. Like, who does that? Crashes into a building? I was stunned. We were all stunned. Two planes hitting the two twin towers minutes apart was no coincidence. Something was going on…. The news that would flood the airways and television screens for the days to come would be some of the most morbid, tragic words and images any American would hear in their lifetime. People jumping from buildings 40 – 60 stories in the air to spare the agony of being burned alive. There were graphic pictures and even more graphic news footage of people running for cover when the second tower could no longer hold on. That tower came crashing to the ground in defeat, taking thousands of people with it. I was in a relationship with a man whose sister worked at the Pentagon. We feared the worst. Optimistically, we heard that there were survivors in the Pentagon. His sister had been working on the opposite side from where the plane (missile) had hit. We received sad news. His sister was granted a promotion… to the annihilated side of the building two weeks before the attack. Eventually, after the dust settled and life had to go on, we all got back to our lives. It all felt different. Freedom. Solidarity. United States of America. It took on new meaning. People flew flags anywhere they could. They taped them to their car antennas and got magnets for their trunks. And somehow, in some weird twist, many people I have talked to from then until now, knew someone (or someone of someone) killed in the 9/11 tragedy. One Nation, Under God, Indivisible… With Liberty and Justice For All.